Revelations about how Hillary Clinton violated our national security laws show that she is not qualified to be our next president. Uncovered also is how President Barack Obama lied when he said he did not know Clinton was using a private e-mail account to conduct government business. 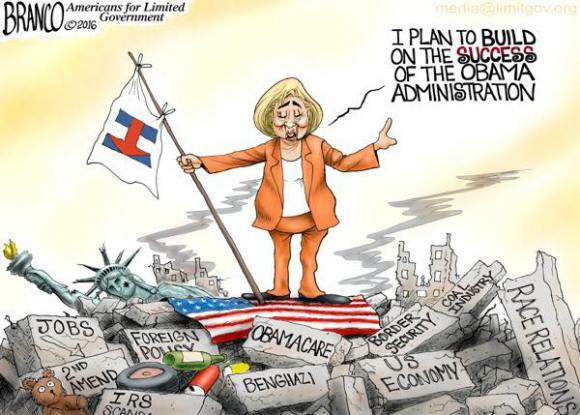 Here is a cartoon that explains why President Obama is providing cover for Hillary Clinton's illegality. Below are articles on the subject of Clinton's national security violations. The State Department just knocked a gaping hole in Hillary Clinton's happy e-mail fable. State, the Associated Press reports, won't release 22 of Clinton's messages to the public because they contain too much most-secret information. OK: Clinton's only promised that none of her e-mails were labeled "classified" — so she's technically not a blatant liar. But US intelligence agencies have determined these message contain enough sensitive information that even blacking out whole passages isn't enough to make them safe for public view. These e-mails are part of a trove of 7,000 pages — the last from Hillary's private server the State Department was poring through — that were to be released this month. But State's not done: Last week, it declared that the winter storm would cause a delay — conveniently until after Monday's Iowa caucuses. And this week, State added another delay: It got a late start in getting clearances from various intelligence agencies, so it now won't finish until Feb. 29 — after the New Hampshire and South Carolina primaries. By holding the "top secret" e-mails on her home-brew server, Clinton should be looking at 22 criminal counts. But her campaign is claiming she's just a victim — of bureaucratic over classification. Funny: Hillary's staffers should have no way of knowing if that's so — unless she let them view the e-mails, which would be another crime. At a minimum, there's this: In just 11 months, the Clinton camp's defense has gone from claiming "no classified" material was ever on her private server to insisting nothing "marked" classified was there to telling America that, well, it's all "over classified." Not that Team Hillary is alone in lame-denial-land. White House Press Secretary Josh Earnest said Friday that the FBI's investigation "does not seem to be . . . trending" in the direction of an indictment. How the heck would he know? No one in the White House should be privy to what's going on in this Justice Department probe. Unless, of course, information is being illegally leaked . . .
To sum up: Hillary Clinton's defense of her conduct is now reduced to technicalities; the State Department looks to be slow-walking the release of her e-mails with an eye on the campaign calendar — and the White House seems to know a bit too much about an unfolding investigation. It's almost like a coordinated cover up. But The Associated Press has learned seven email chains are being withheld in full from the Friday release because they contain information deemed to be "top secret." The 37 pages include messages recently described by a key intelligence official as concerning so-called "special access programs" — a highly restricted subset of classified material that could point to confidential sources or clandestine programs like drone strikes or government eavesdropping. "The documents are being upgraded at the request of the intelligence community because they contain a category of top secret information," State Department spokesman John Kirby told the AP, describing the decision to withhold documents in full as "not unusual." No, it isn't unusual. What is unusual is that these Top Secret documents came from Hillary Clinton's home brew server, contrary to federal law and State Department rules. Hillary's only defense, as best as I can tell, is that none of the emails on her server were stamped "classified," "Top Secret," or whatever. This could be because those that were stamped were deleted before the emails were turned over to the State Department. In any event, her defense is irrelevant: both the federal law and the State Department regulation relate to documents that are in fact classified, not just those that are so stamped. Federal employees can't circumvent the law by failing to stamp the documents they create or receive. And Hillary Clinton, as Secretary of State, was one of those specifically charged with knowledge of what documents should be, and are, classified. PAUL adds: Hillary Clinton has argued for months that there is a dispute between the intelligence community and the State Department as to the sensitivity of documents on her server. The State Department's confirmation that documents on her server were "Top Secret" undercuts this defense. The comment of State Department flack John Kirby that the documents "are being upgraded at the request of the intelligence community because they contain a category of top secret information" represents State throwing in the towel in this dispute, it seems to me, although Kirby does his best to make it seem like an accommodation, rather than a concession.